When it comes to getting paid what you’re worth, it’s not just about your job skills. It’s about how well you negotiate at the table. Confidence aside, here are 3 concrete tips for helping you negotiate a salary that’s worthy of your skills. Give Yourself a Raise if You Deserve It. You’ve heard the old adage, “the first person who gives a number loses”, right? Well…wrong. The better negotiator always wins! If your negotiating skills aren’t on point, there’s no reason for you to start the numbers game. Remember that employers always negotiate down, so be prepared to initially ask for 10-20% higher than the salary you’re willing to accept. Do your homework so you know what that 10-20% equates to in dollars. If the company asks what your number is, first tell them you’re negotiable. However, don’t be surprised if they press for a number and when that happens, give your number. The negotiation has just started. 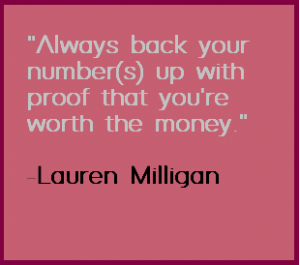 Always back your number(s) up with proof that you’re worth the money. Employers hire problem solvers; show concrete examples of how you can solve their problems. Be Broadly and Deeply Informed About Salary Standards for Your Position and Responsibilities. Research, research, research salary standards for similar experience and responsibilities in the same or similar industry. There are sites that even break this information down to the zip code. You need solid information to back up your salary expectations. When providing comparable data, using statistics and examples from their particular industry or something similar gives you more credibility. If You (Genuinely!) Have Multiple Offers, Let Them Know. When you’re discussing (briefly) the other offer, mention that the offer is for a similar position, so that it’s considered and apples-to-apples comparison. If there is no other offer, DON’T fabricate one! Bonus Tip: When It Comes to Accepting a Position, Take Your Time, But Not Too Much. When a company extends an offer, it’s fine to ask for a little time. Tell them you’d like 48 hours to thoroughly review through their offer and any information about the position, company and benefits that they’ve sent to you. If you ARE waiting for another offer, this gives you time to check in with that company and let them know that you’re considering the first offer. However, I don’t recommend more than 48 hours. Trust me, they already know who the backup candidate is, should you decline. If you ask for more than two business days, they could tell you that they have someone who is already waiting to hit the ground running. If you know before the 48 hours are up that you’d like to take this job, let them know right away. Don’t wait until the countdown ticks to zero. The bottom line: The key to negotiating is to know your worth, and be confident in your ability to fight for it! 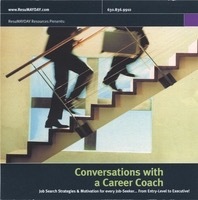 For personal negotiations coaching, contact ResuMAYDAY at 630-901-3595. Since many job seekers take time off to celebrate the holidays (assuming employers aren’t looking), you’ll encounter less competition when applying for jobs. Employers continue interviewing through the end of the year, so it pays to send out applications. Even if an employer isn’t hiring, take the time to make an initial connection. For many companies, their fiscal calendar works around the traditional calendar. That means a company’s budgets resets on January 1. If you send your application in now, you’ll be ahead of those who will pick up their job search mid-January. By applying over the holiday season, you jump to the head of the line with employers who want to onboard their new employees at the start of the year. By applying in December (or November!) you’re ready to start working when the job opens. 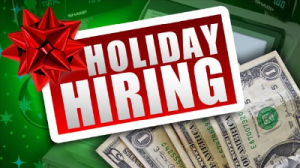 Employers report there is a shortage of applicants for open positions around the holidays. Companies that need to fill positions quickly are apt to move forward on qualified applicants who touched base at that time. And of course, employers like to hire at the end of the year to spend down the budget they have, in order to boost the budget next year. Continuing your search – even ramping it up during the holidays can make all the difference to starting your new year as a new employee. You can do this! Seasonal Jobs…or Seasonal to Permanent! Employers start interviewing for these positions in the fall, so there’s no time to lose. The search for a seasonal job is much different than finding permanent employment, in that employers generally hire their seasonal staff during or right after a first interview. Keep an eye out for job fairs at distribution centers, warehouses and office complexes in your area in October and November. 1) Stand out for the right reasons: Let your boss see you going the extra mile. Pick up that overlooked, crumpled litter that was meant for the trash can, instead of stepping over it like everyone else. Smile and greet every customer, and offer to help even if it isn’t your department. Help other employees when you have extra time. Approach your work with a positive, whatever-it-takes attitude. 2) Think about the company’s needs after the season is over: Think like a permanent employee, not someone who will be gone in a few weeks. Are there problems you can solve, or have you caught wind of long-term projects that might be well-suited to your skills? Offer your experience in ways that expand your usefulness to the company. 3) Let Your Intentions Be Known: A week or two into this new job (not on your first day! ), talk to your boss. Let her know that you enjoy the company and the work, and that if a permanent role opens, you’d like to apply. Your boss isn’t a mind-reader, and she’s extra busy during holiday seasons. She may see you as a great short-term employee without even thinking about the long game. It’s your job to plant that seed. If you need help ‘right-sizing’ your resume for a seasonal job, get in touch with the experts at ResuMAYDAY. Remember, these jobs go quickly so you don’t have a moment to lose! Keep Your References In Check!